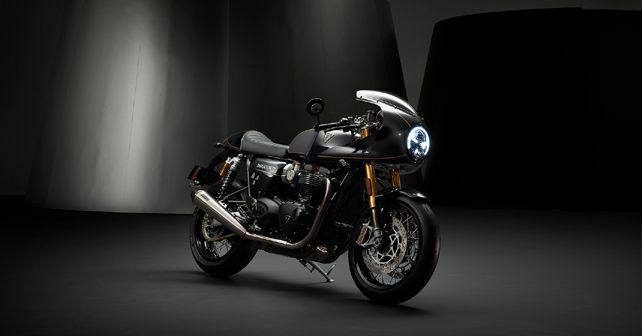 The Thruxton TFC forms a part of the exclusive Triumph Factory Custom (TFC) offer for 2019; only 750 units of the bespoke motorcycle will ever be made. Triumph Motorcycles has recently gone on to unveil its limited edition 2019 Triumph Thruxton TFC, an offering under the company's larger rubric of factory custom motorcycles referred to as the 'Triumph Factory Customs' or, TFC. The genesis of the TFC initiative can be traced back to the 2014 Triumph TFC Bobber and TFC Scrambler. As the TFC ritual, the Thruxton TFC bespoke carbon-fibre body panels, tuning upgrades and exquisite craftsmanship to make it a truly unique offering. Moreover, each of the 750 fortunate buyers will be reminded that they are a part of an exclusive club every time they look at their bike, thanks to individual numbered badging present on each bike. In terms of styling, each unit of the Thruxton TFC will sport a 'Deep Satin Black' paint finish along with brushed-aluminium inserts on the fuel tank. Body panels like the fairing, fuel tank and the rear seat cowl have additionally been given hand-painted gold pin-striping for a bespoke touch. Due to the extensive use of carbon-fibre in the bodywork, an overall black theme has been followed, further reinforced by the black-finish wheels, rear shock absorbers, engine casings and fenders. A 'TFC' plaque can be found on the billet-machined aluminium-top yoke. Mechanically, the Thruxton TFC remains unchanged by using the same 1,200cc parallel-twin motor which powers the Thruxton R. However, to make the specs bespoke, Triumph has re-tuned the motor to give the TFC an additional 10bhp and 3Nm torque over the standard bike. As mentioned above, the use of carbon fibre bodywork and aluminium engine rail upgrades have made the Thruxton TFC lighter by 5kg. Other component changes include a fully-adjustable Öhlins suspension and a Brembo radial master cylinder with an adjustable brake lever. For further performance upgrades, the Thruxton TFC comes shod with race-spec Metzeler Racetec RR tyres and a Vance & Hines exhaust system. Bookings for the Thruxton TFC are now open in the UK and deliveries are slated to begin from June 2019. Triumph's 2019 TFC line-up also includes a Concept version of the new Rocket III bike, which will be launched on 1st May 2019.